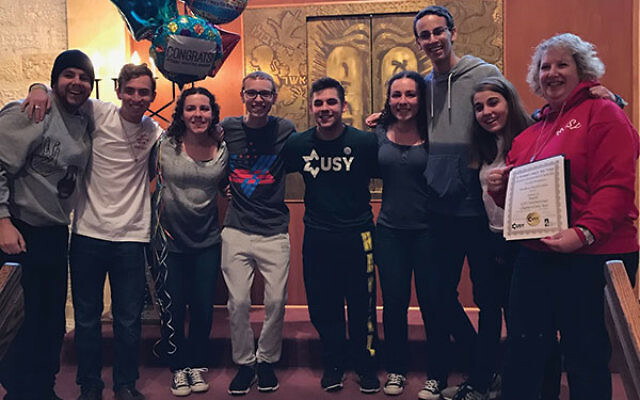 The MUSY crew who helped win the International USY Chapter of the Year Award included, from left, Gregory Yellin, Shawn Konichowsky, Gabrielle Kaplan, Cory Fox, Joshua Eiger, Jessica Kaplan, Seth Katz, Hannah Eiger, and Lori Solomon. Always a bridesmaid, never a bride no longer applies to Marlboro Jewish Center’s USY. 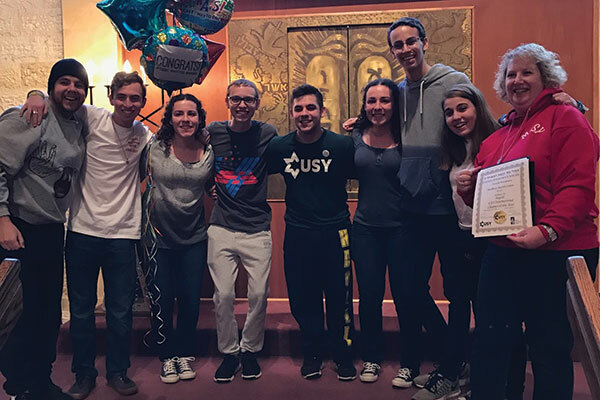 After winning numerous awards over the past decade, including best chapter in United Synagogue Youth’s Hagalil region, which covers New Jersey, the teen members and their adult advisers have captured the biggest prize of all — International USY Chapter of the Year. The award, presented in mid-November at Hagalil’s fall convention, recognized the youth group for “overall excellence, diversity, creativity, and value of programming,” said Rabbi David Levy, United Synagogue of Conservative Judaism’s senior director of teen learning. The presentation took place at Temple Beth O’r Beth Torah in Clark. “I really feel like we won an Oscar,” said Lori Solomon, MJC’s youth director for the past 14 years. Noting that the award covers the period from September 2015 to June 2016, Solomon said, “This is the highest honor a USY chapter can receive.” It also comes at a critical juncture for her, as she will be retiring in January and moving to Sarasota, Fla. When Levy announced the result at the convention, about a dozen teen members of the MJC chapter, known as MUSY, converged in an exuberant group hug. Two key officers, Hannah Eiger, president during the contest period, and Cory Fox, the current president, clung to each other and cried tears of joy. Hannah, 16, and a junior in the Contemporary Global Issues program at Freehold Township High School, said her involvement with USY continues a long family legacy. Her mother Rhonda and older sister Danielle were active members of USY in their teens, and Danielle was MUSY chapter president in 2012-13. Hannah’s twin brother Josh is the former Social Action Tikun Olam (SA/TO) vice president of the chapter. Asked what was special about MUSY in 2015-16 that led to its taking best chapter honors, Cory said, “We have weekly events, an attendance of 30 or more at many of our events, and a huge gym (at MJC’s auxiliary Chai Building) where we are able to play games and accommodate our large attendance.